While NASA’sCassini spacecraft might be on a collision course with Saturn we’re happy to report that its Juno spacecraft is still absolutely bringing home the goods in orbit around Jupiter. Most notably is this absolutely breathtaking new image from Juno’s on-board camera. Taken on the 10 July during Juno’s seventh close flyby the image shows Jupiter effectively flipped on its side as the spacecraft heads from the north of the gas giant down to the south. The image was then edited and enhanced to perfection by citizen scientists Gerald Eichstädt and Seán Doran. These two have been edited and enhancing NASA’s images for a while now proving time and time again that as long as NASA keeps uploading the raw data they can turn it into something as stunning as this. 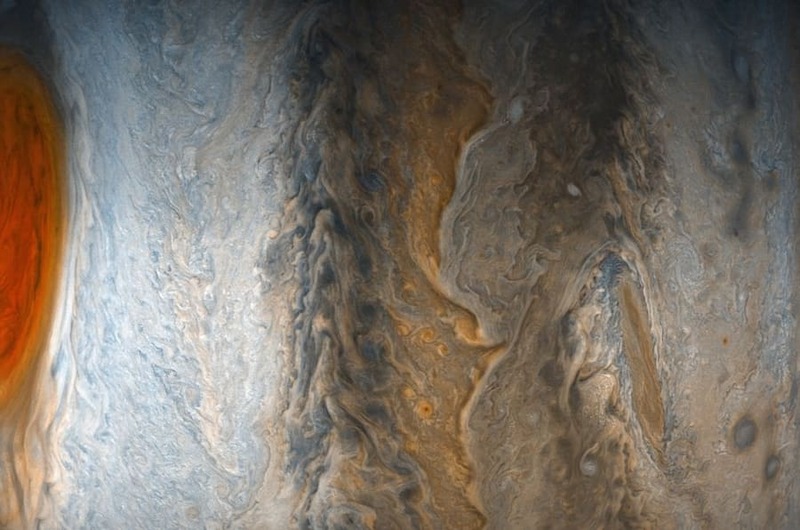 The pair recently produced this fantastically moody image of Jupiter’s ‘Little Red Spot’ which can be found on the planet’s northern hemisphere. Jupiter’s ‘Little Red Spot’ has been tracked by scientists since 1993 and is what’s known as an anticyclone. As explained by NASA, an anticyclone is a weather phenomenon where winds around the storm flow in the direction opposite to that of the flow around a region of low pressure. While the perspective suggests that you’re looking upwards at Jupiter’s north pole the image has in fact been rotated so that the top of the image shows the south pole instead.